Most people think of waffles as a breakfast treat, but while in Finland, I learned that waffles are considered a dessert. 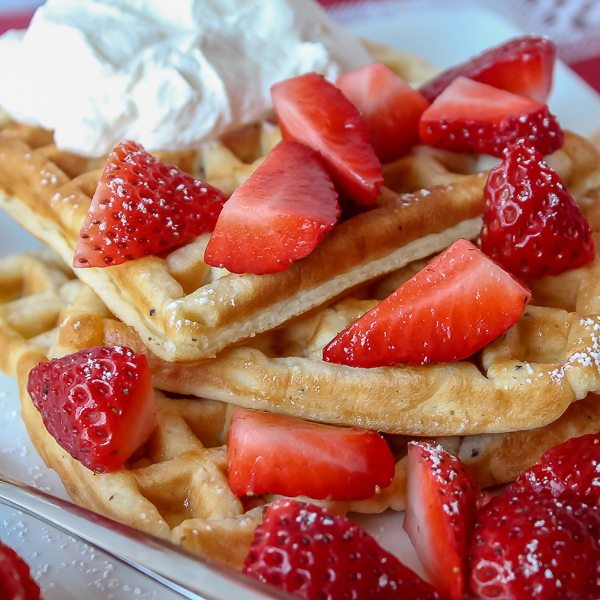 These sour cream waffles can still be made for breakfast with maple syrup and sausages if you prefer, but once you taste these delicate ones kissed with cardamom, and served with strawberries and whipped cream, you might change your mind and have them for dessert instead. 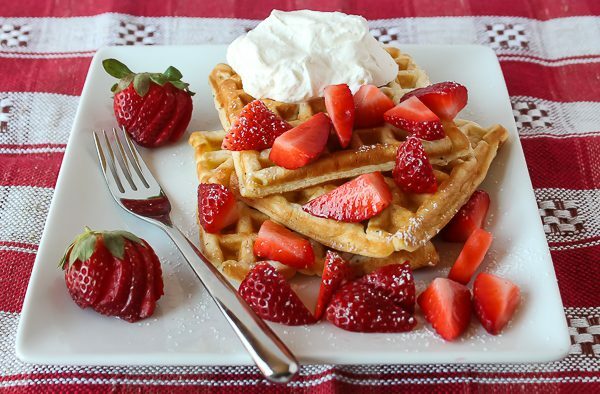 And since March 25th is also Waffle Day, this is the perfect weekend to make this luscious dessert. Sunday, March 25th is recognized as Waffle Day, not to be confused with National Waffle Day in August. Waffle Day began in Sweden as the day to eat a lot of waffles, but the one in August is celebrated as the day the first waffle iron was made in the USA. Hey, let’s celebrate again in August since waffles are so good, but today let’s just eat these wonderful Scandinavian-inspired Springtime waffles. Heavy cream, freshly whipped, at least ½ cup, but you will probably want more! Start heating up the waffle iron while preparing batter. In a medium mixing bowl, combine flour, salt, sugar, and crushed cardamom seeds. In another bowl, beat eggs and sour cream together until well-blended. Add to dry ingredients and mix until blended. Spread batter to fit the hot iron, usually about 1 cup but depends on the size of your waffle iron. Cook waffles until done, remove and continue making waffles until batter is used up. 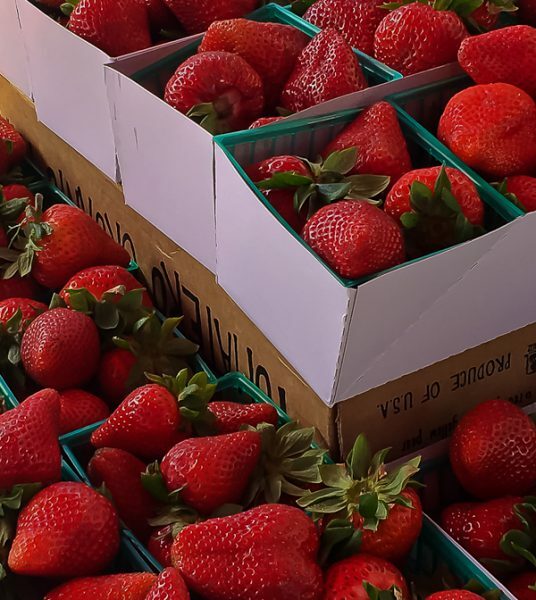 Serve warm waffles sprinkled with confectioner's sugar, sliced strawberries (or your favorite berry or fruit) and top with whipped cream. Serves about 4 people, depending on size waffle desired. P.S. In Finland, you can buy the already coarsely crushed cardamom seeds, but this is not available in the USA, which is why you need to crush the seeds yourself. Powdered cardamom will not work in this waffle recipe and won’t taste the same as the crushed seeds. These waffles really sound delicious! Finnish cardamom is the best ! 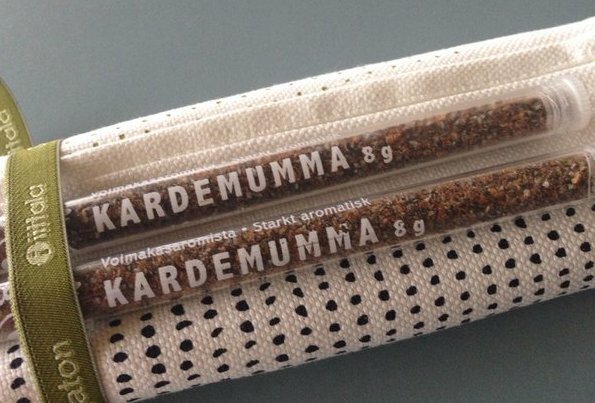 I have my Finnish Kardemumma (thanks to my sweet Finnish friend & her daughter!) and can’t wait to try out your waffle recipe! Thank you so much!! You’re welcome, Kim. I think you will love it!